To celebrate 2017's International Women's Day, Haelan Therapy along with a group of inspirational business women in Hitchin, came together to create a film to #BeBoldForChange. Hitchin has a very supportive business community and we were very proud to stand united in our support for each other. We were lucky enough to feature in the Comet ahead of our Open House event on Saturday 10th December 2016. To read the article in full, please click HERE. December 2016, Living in Hitchin, "We Love Winter Hitchin"
Haelan was very proud and privileged to be involved in the second instalment of the #welovehitchin film series. We spent the afternoon filming with Whitepartridge Media and had a lot of fun! We think it is a great representation of the town we live and work in. Haelan Therapy was honoured to be awarded Best Complementary Therapy Centre in the Muddy Stiletto Awards 2016 for the second year running. "I opened the doors to Haelan Therapy in 2012 and have been growing the business ever since. I now have two treatment rooms based in Hitchin and St Paul’s Walden (at the Learning to Listen Centre), and along with my colleague Jo Osborn, we provide holistic therapy treatments in Massage, Reflexology, Reiki, Energy Healing and Transformational Coaching. 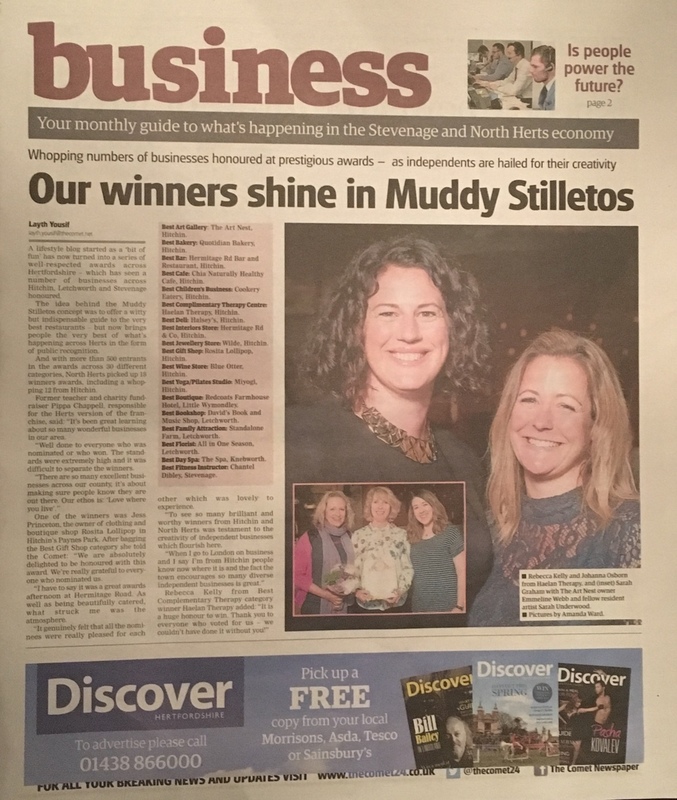 Winning the Muddy award for the second time has continued to help me transform my business. We are very passionate about what we do and knowing that our clients support our work and were willing to give us their vote, gives me the confidence not only in myself and my ability but in growing and developing the business too. Hitchin has such a fantastic local business community and it was privilege to be at the Awards event at the Hermitage Road Bar and Restaurant on Friday alongside many other small businesses in Hitchin including Chia Naturally Healthy, Cookery Eatery, Rosita Lollipop, My Yogi and Wilde Jewellery amongst others." Alongside our treatments in the therapy room and as trained Equine Facilitated Coaches, we work in association with Learning to Listen to deliver 1-2-1 Equine Facilitated Coaching sessions to which can help people to work through beliefs that are limiting their lives, such as their career or personal relationships. Rebecca had the pleasure of working with Zoë Folbigg, a freelance journalist from Hitchin who was so moved by her experience that she went on to write about it for the Holland & Barratt 'Healthy Magazine'! We are really pleased to announce that the article features in the May edition and we think our lovely mare Bow looks pretty spectacular in the photo with Zoë. Click on the article above to zoom and read all about Zoë's experience. You can also click HERE to read the testimonial Zoë wrote after her first session. Rebecca had the pleasure of being asked to be Top Sante's Wellbeing expert for their February edition. Rebecca was asked to answer questions from their readers on Reflexology. Top Sante is one of the UK's leading wellbeing magazines dedicated to health, psychology, anti-ageing, diet and nutrition. 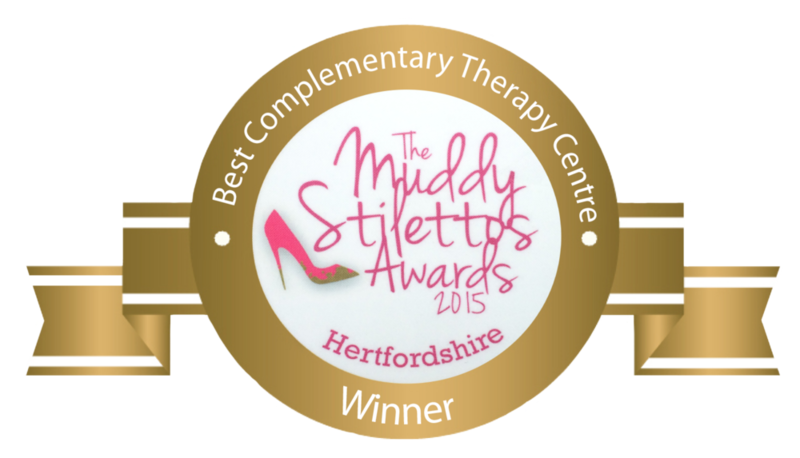 Haelan Therapy was honoured to be awarded Best Complementary Therapy Centre in the Muddy Stiletto Awards 2015. Haelan was nominated alongside a number of popular and well regarded holistic centres in Hertfordshire. We appeared in the business section of The Comet newspaper online side the Pilates Pod, winners of the Best Pilates Centre award. You can read the full article online here. Haelan appeared in Muddy's online blog in May. You can read the full write up here. Pippa Chappell, editor of Muddy Stilettos Herts, came to experience a treatment with Rebecca and the article is written from her point of view as a client and what she thought of her experience. The Muddy blog is hugely informative and you can choose to read it online or receive snippets in your inbox. It was a pleasure to receive the Muddy Stilettos Best Complementary Therapy 2015 award from Pippa at The Womens Society shop in Hertford. Muddy Stilettos is a witty and indispensable guide to the very best restaurants, walks, boutiques, day trips, hotels, interiors and events in the region. Do take a moment to visit Muddy's page here . It is well worth a read and Pippa is a wonderful writer.